A very warm welcome to the all new motoparilla.co.uk website. The primary aim of this site is to provide a practical source of information, reference material, parts availability, and resources to assist like-minded individuals wishing to maintain, fettle, restore or even race their Moto Parilla’s. Yes, we said race, they can be made to go very well indeed. Or for that matter to encourage those researching or just dreaming of owning one of the most beautiful motorcycles ever made to join our ranks. Whatever your reason for visiting we hope you’ll find something of interest here. News, Updates, Musings and Ramblings will be posted on a regular basis in the “From the Garage” section at the bottom of this page to keep the reader up to date with news and developments in the high-speed world of Parilla spannering! Enjoy your browsings and be sure not to miss the GP Rider section. The jewel in this sites (oily) crown. GP Rider documents Richard Morley’s experiences as a GP Rider on the “Continental Circus” in 1964. Penned by Richard himself in a thoroughly engaging, informative, often witty, and always accessible, self-deprecating style. The Moto Parilla is one of the most beautiful bikes you could wish to own. Let it be the tiny Parilla Parillino or the sporting Parilla MSDS it is a bike which will catch the eye of both fellow enthusiasts & the casual passer-by. What is it that makes the Parilla so attractive? The flowing lines of the cycle parts? The variety of colours & their accentuation by chrome & polished alloy? Hopefully, they will be enthused enough to search the web for information & if they find this site then maybe one day they will join us as Parilla owners or wannabes? In the bike enthusiast, the effects can be long lived. From a fascination with, & need to know more about, the Parilla marque; to a craving to own a Moto Parilla as soon as possible & ultimately restore it to running order. Restore it to running order? Yes, that’s the problem. Parillas are pretty rare & when one does come up for sale it’s usually in need of some TLC. From a cosmetic makeover (if you are very lucky) to a full mechanical rebuild & the problems that entails sourcing parts & people who understand the Moto Parilla marque. Hopefully, we can help out in these areas & encourage you to attempt that rebuild. Ultimately I hope the site will be able to document a full Parilla rebuild – engine, cycle parts & electrics. I started in the enthusiast category. A long time owner of Brit bikes I was blinkered to the delights of Italian lightweights. Having passed my test on a loaned Lambretta GP200 I couldn’t wait to graduate to a bigger “real” bike. This I did…. & indeed I still have the Norton 600cc “99” I started out on 30+ years ago…..& never looked back at the smaller classes of bike. Until I read about the MotoGiro D’Italia in 2000. 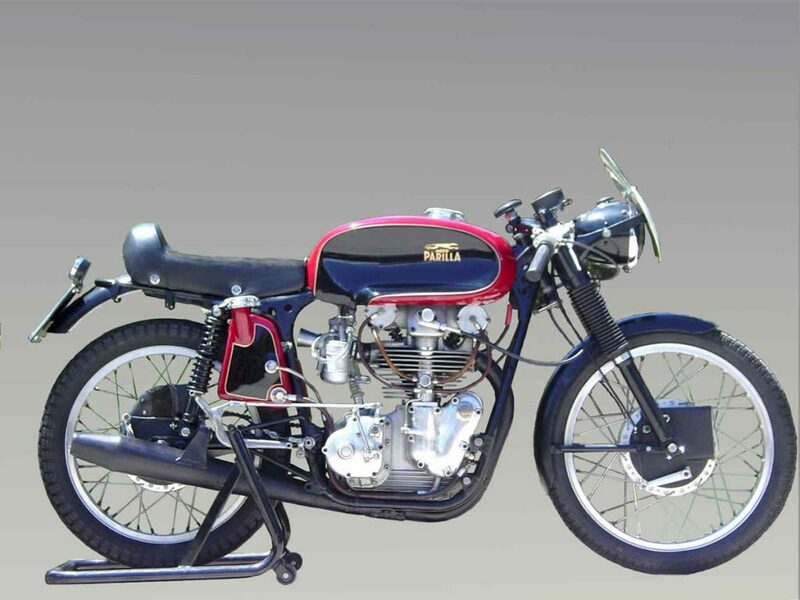 I needed a 175cc bike of pre ’57 vintage to compete & off I went looking for a Ducati. 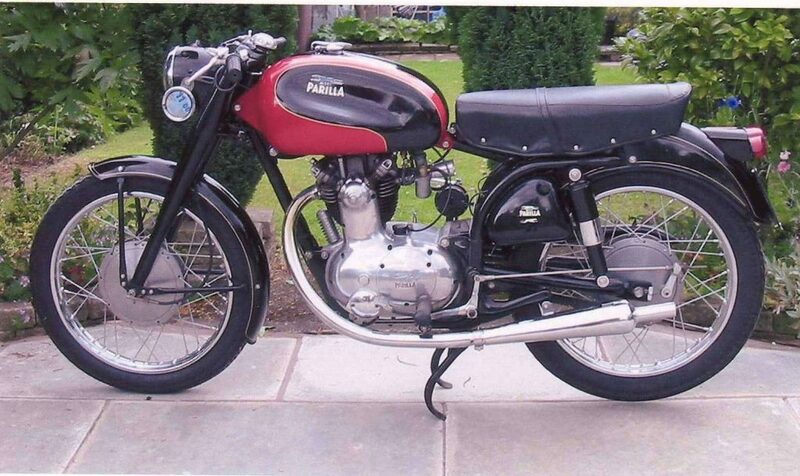 That was until I saw my first Moto Parilla 175 Turismo on a website….. Smitten. It was then just a matter of finding a sporting version for the Motogiro. I was lucky in that a Parilla 175 MSDS/GS was being offered a short distance away…how lucky you will see a little later ! This is a complete ground up rebuild of the original site which I was no longer able to edit. Most of the original content is carried over but now with a “hopefully” clean modern look with an accent on clear presentation and ease of navigation. We hope you find the site intuitive to use. The top menu which is always visible, even when scrolling, can be used to navigate to your area of interest wherein where relevant you will find sidebar menus to navigate the content of that category in more detail. Sunday 3rd of June 2018 - An invitation has been issued by the organisers to any Moto Parilla owners who would like to attend this event. Situated on the Wales/England border quite close to Ludlow.